More power to the lady…and the man you stood behind her!! Hey Anamika (nice name 😉 ). Totally agree with you. 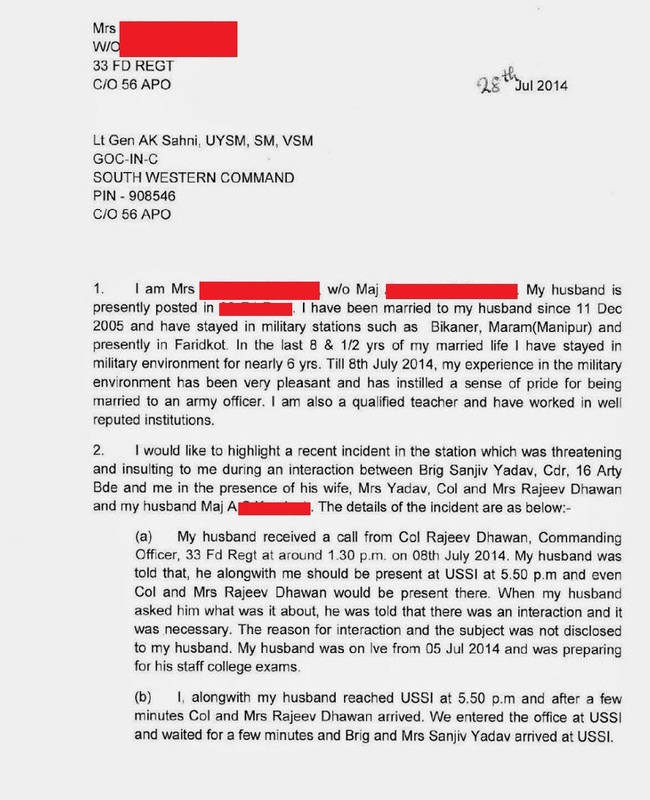 I am not an army wife; in fact I am a male visitor to the blog which I found interesting. Just one thought struck me. In the letter posted on the blog, you have covered up the name of the lady who wrote the letter but left all other names open to public view. Do you believe this to be correct form? Both parties should be treated equally else it appears as if one is laying open accusations from a cover of anonymity. While her name is there on the blog post (in the first line in fact), yet the issue rankles. Hi Harri, all visitors are welcome here, male and female :). About the letter, there was little I could do since it was like this when I got hold of it. We knew the name of the lady and officer concerned, so all I had to do was check whether the letter is authentic. Once that was done, I wrote the name of the lady in my blog post… that was the only way I could balance it. Blog Admin and ladies, Please get in touch with us, we publish India’s first popular magazine for the forces called FAUJI INDIA with Maroof Raza as editor. We are looking for contributions from Fauji’s wives. our email is – faujimagazine@gmail.com and our blog is at – faujimagazine.blogspot.in……Capt Prasoon 9820001918. Hi, I’m glad that the lady and the officer had the courage to stand up to this practice. I’m the daughter of an army officer, and have always said in the fauj they make the two of you work (spouses) and pay you for one. Aside from that, the fact that children are many times left alone and locked in the house (ofcourse once they are old enough to be locked up). Other times there is the bhaiya taking care of the kids; there are hardly any officers and ladies with family support (parents) to look after the kids. And worst is that leaving your kids alone exposes them to a number of risks, of which one I can personally speak of is sexual exploitation in the hands of the help you leave them with. Is it not enough that the officer has fought a couple of wars, doesn’t get to live with the family almost half of his service life. Why should the children have to suffer this? I don’t think army will ever change. Where the world is and where they are! Its really sick. !